Baby B's nursery is starting to come together! We have the crib, rug and rocking chair. The Pottery Barn furniture will be delivered next weekend and I'm finalizing the other elements. I'm anxious to get everything set up and see it all come together. I lucked out and found the exact Bratt Decor crib I wanted on Craigslist. The style was recently retired. I set up several alerts in the surrounding tristate area and luckily it popped up. At first I was apprehensive to buy a pre-owned crib but realized that was silly. It's made of iron, looks as good as new and there have been no recalls. As for the chair, my mom was adamant about a wooden rocker that could move from the nursery to the living room. I told her about a club glider I had been looking at and she wasn't having any of my modern nursery talk. Well, I'm not going to argue with her since she is close by and will be helping me. I went with the natural color because I figure I can always paint it in the future and liked how the natural finish was incorporated in the nursery below. Now I'm very happy with this decision. I have this Sugarboo Designs elephant print that I adore (posted here). I bought it a few years ago at my favorite store on Martha's Vineyard. It's perfect for a gender neutral nursery. Since my elephant already happily lives on a wall in another room I hope to get the Oui Oui Cherie and another coordinating print for Baby B. They have so many great pieces! Making sure all of these pinks will match. 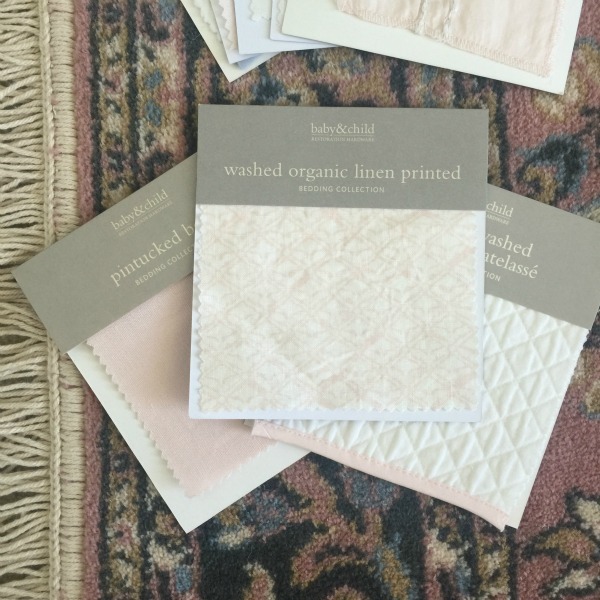 I ordered fabric swatches for crib bedding from Restoration Hardware and the bench from Home Decorators Collection to match a rug I already had. These are the two nurseries that I keep looking back at for inspiration. They are both lovely... wish that I could transplant either one into my apartment. This is so so beautiful and I can't believe you found your dream crib on CL! That's where we got Camille's lovely crib too. I had a brand new one on order but then saw that one and just couldn't get it out of my mind! Oh, and I have a wooden rocker, too. Gliders are awesome and so comfy but my rocker was a special family piece. With a pillow and bottom cushion, you've got all you need! This all looks fabulous! I love the soft pinks! That nursery with the Shel Silverstein poems on the wall, is one of my Pinterest faves! I adore the whole look you're pulling together! This is going to be such a girly chic space without being in your face! So excited for you! !